Keurig B60 Special Edition Gourmet Single-Cup Home-Brewing System 50% Off! This is a great discount deal on the Keurig B60 Special Edition Gourmet Single-Cup Home-Brewing System. A great coffee machine is a good investment and the Keurig brand is one of the leading and most trusted names in coffee makers. Here you can get the Kuerig B60 for 50% off at just $149.99 Shipped. 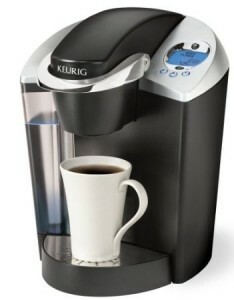 The Keurig B60 is a single cup coffee maker and is one of the most highly rated available. Not only does it make great coffee but it also looks great on your counter top. It brews 5.25, 7.25, and 9.25 oz sizes quickly and without mess. Buying a coffee maker is a great investment if you usually buy your daily brew at a coffee house. Those cups of coffee add up, What better way to save money than invest in a great coffee machine which will not only save you money in the end but also make you a much better tasting cup of coffee? It gets 4 Stars on Amazon with over 2,000 Reviews! Summer Infant Day & Night Handheld Video Monitor just $123 Shipped! Vado HD Pocket Video Camera for only $99.99!